Who said beer bread graced only lunch and dinner tables? Barrett’s Ridge Ginger mix is also ideal for the breakfast nook. Don’t panic, you won’t be cracking open the brews before the rooster crows. Although, they do say that the early bird catches the worm. Top your Barrett’s Ridge Ginger beer bread with honey and let the golden nectar fill every crater of your doughy creation. Pour entire contents of Barrett’s Ridge Ginger into a bowl. Dunk a slice or two of this Barrett’s Ridge mix into an eggy bath and let it soak up the sunshiny perfection to make French toast. And if you’re a strong believer that an apple a day keeps the doctor away, then why not add a little grated apple to your bake to give it a deliciously healthy and tasty twist. Here’s a twist you never saw coming. A brew-less beer bread. 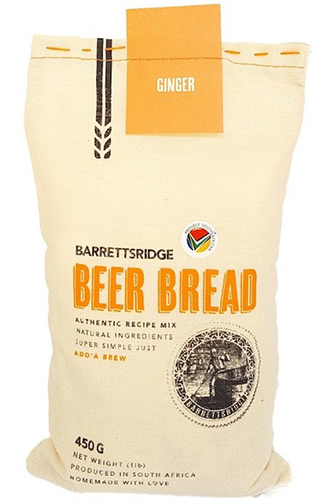 We recommend adding soda water to your Barrett’s Ridge Ginger mix. You’ll be surprised to see the rise you get out of this puppy.